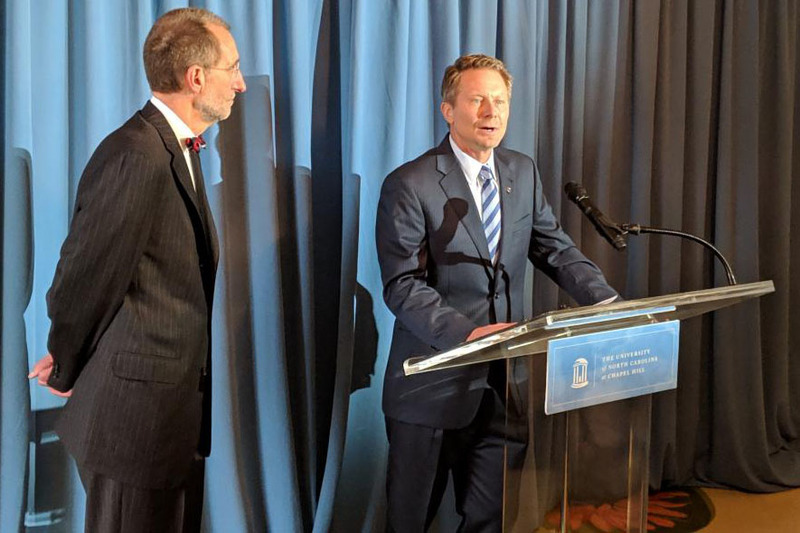 UNC Interim Chancellor Kevin Guskiewicz (right) appears at a news conference with Interim UNC System President Bill Roper. Six days after Carol Folt left the position of UNC Chancellor, her replacement was named. Interim UNC system president Bill Roper tapped Kevin Guskiewicz to be interim chancellor. He’s expected to serve while the university and the UNC system Board of Governors complete a national search to succeed Folt, who resigned in January. Guskiewicz has been with UNC since 1995 and has served as Dean of Arts and Sciences since 2016. He’s widely known for his research on sports-related concussions and brain injuries, which has influenced the concussion guidelines in college athletics and the NFL. Guskiewicz still serves on the NCAA concussion committee. At the introductory press conference on Thursday, Guskiewicz and Roper were asked about the future of the confederate monument Silent Sam. Roper responded by saying Guskiewicz’s stance on the matter was a big factor in his selection as interim chancellor. The two interim leaders agree that the statue, which protesters pulled down last year, should not return to UNC’s campus. A day after Guskiewicz took over, another controversy developed. A 1979 UNC yearbook page resurfaced and sparked outrage. It pictured white members of Chi Phi Fraternity dressed in Ku Klux Klan costumes and black face. N.C. Insider editor Colin Campbell originally posted the photos on his Twitter page. The national Chi Phi organization denounced the behavior on Twitter, stating “bigotry is not welcome in our Fraternity.” The University also condemned the photos on Twitter, and Guskiewicz responded to the photos during the Thursday press conference. Guskiewicz suggested he’d like to be a candidate for the permanent chancellor position during the national search.